a. Connect the intelligent tester to the DLC3. c. Turn the tester ON. d. Enter the following menus: DIAGNOSIS / ENHANCED OBD II / DTC INFO / CLEAR CODES. e. Press the YES button. a. Perform one of the following operations. 1. Disconnect the negative (-) battery cable for more than 1 minute. 2. Remove the EFI NO. 1 and ETCS fuses from the engine room junction block located inside the engine compartment for more than 1 minute. Compared to normal mode, check mode is more sensitive to malfunctions. Therefore, check mode can detect the malfunctions that cannot be detected by normal mode. 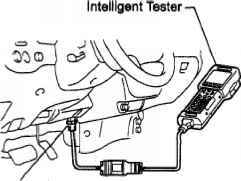 NOTE: All the stored DTCs and freeze frame data are erased if: 1) the ECM is changed from normal mode to check mode or vice versa; or 2) the ignition switch is turned from ON to ACC or OFF while in check mode. Before changing modes, always check and make a note of any DTCs and freeze frame data. How do you clear the DTC using the intelligent tester and check that no DTC is output. ?